CATCH THE BUZZ – Bees! They May Be Your New Neighbors, But Don’t Panic. Beekeeper Toni Burnham shakes a tree branch, sending a swarm of tens of thousands of bees flying. Toni Burnham will be a guest on the May KIM&JIM show, sharing much more about the DC Bees group, and what they have accomplished in this extremely urban beekeeping setting. Don’t miss it! Urban beekeeping is all the rage lately — in D.C. it’s been growing in popularity since it was legalized just over five years ago. That means many of us are living in close proximity to bee colonies, and this time of year, as the warm weather hits, it’s not too uncommon to see a swarm of thousands of bees. But don’t panic — there’s help nearby. On a recent sunny afternoon, when the temperature had risen from the 40s in the morning to the mid-70s, Sherry Cohen is all geared up in her beekeeping veil and jacket. She is looking up at a tree branch covered in bees. Lots of bees. “Maybe about 20 or 30 thousand bees,” she estimates, looking at the large clump. Cohen and her fellow beekeeper, Toni Burnham, cut away foliage and set up a step stool to reach the branch. Then comes the fun part: Burnham grabs the branch and gives it a hard shake. Suddenly the air is filled with bees — many of them fall into a cardboard Staples box Burnham is holding. “Alright let’s see where they go,” says Burnham. “If the queen is in the box, the loose bees will follow,” says Cohen. Bees swarm in the spring — over the winter the hives have been growing, and now the bees need more space, so they split up. Some stay behind with a new queen, others leave with the original queen bee, looking for a new home. These bees are from a hive at a community garden in Upper Northwest D.C., and they eventually settle down in the Staples box (bees are relatively tame when they swarm — before leaving the hive they fill up on honey, and are unlikely to sting.) Burnham eventually loads the box into her Kia Soul and drives to a local agriculture non-profit. 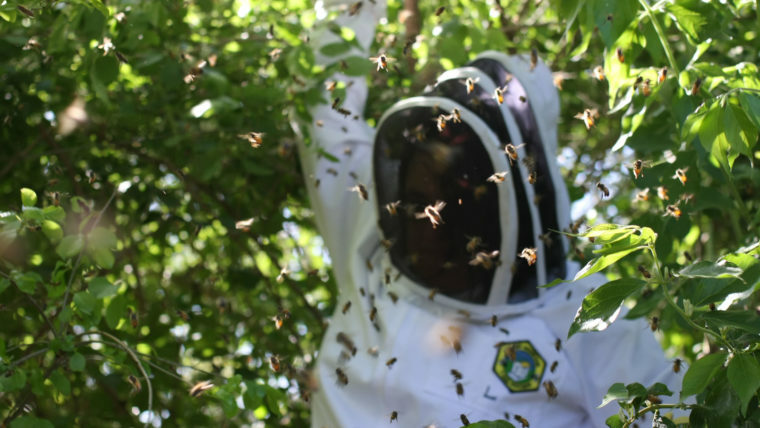 Burnham and Cohen are part of the D.C. Beekeepers Alliance’s Swarm Squad, a group of more than sixty local beekeepers who jump into action whenever someone reports a swarm. With the swing in temperatures yesterday, Burnham spent all afternoon responding to call after call. “But you know what? Hot damn it’s fun,” she says.